Turbulence and change are prevalent characteristics of global markets that expose organizations to many environmental phenomena beyond managerial control and these risk events may have significant adverse effects on economic outcomes. Societal wealth creation, therefore, depends on the ability of public and private enterprises to organize in ways that make them responsive to these often unforeseeable influences. Multinational corporations, small-medium sized businesses, public sector entities, the communities in which they operate, and society at large are exposed to many factors that are outside the control of executives and policy makers. These exposures span a variety of influences ranging from commodity and financial market prices, macroeconomic conditions, operational disruptions, human misconduct, technological shifts, competitor moves, socio-political events, natural hazards, man-made disasters, etc. Each of these risk areas are addressed through rather disparate practices of financial risk analysis, exposure limits, actuarial modeling, insurance contracting, alternative risk-transfer, contingency planning, risk mitigation, preparedness, etc. Business enterprise and society are also faced with potential systemic risks embedded in interacting global markets, worldwide climatic changes, and threats of international terrorism. All of this accentuates a need for effective strategic risk management practices to deal with these phenomena both at corporate management and public policy levels. Risk can be conceived as the failure to optimize economic performance caused by inability to deal effectively with environmental uncertainty and unexpected events. Societies and the organizations that operate within them will be hit harder from turbulent market conditions when potential risk factors and resulting exposures are ignored and insufficient precautions are made in advance. Risk awareness is, therefore, a first step towards reaping potential benefits from risk management. That is, if potential risk factors are recognized in advance, the element of uncertainty and surprise is vastly reduced. The more effort devoted to identify, understand, and counteract possible risk factors, the better inherent exposures can be managed. All the while, emergent threats and new market conditions represent opportunities for change that can be exploited by responsive organizations. Hence, strategic risk management is more than trying to avoid downside losses but also relates to an ability to optimize performance outcomes by engaging in new activities that allow the organization to exploit opportunities arising from changing market conditions. Strategic risk management incorporates contributions from different professional fields and academic disciplines, such as, finance, insurance, accounting, business policy, international business, disaster management etc. This illustrates a need for integrative analytical perspectives while recognizing that specialized expertise is needed to circumvent negative economic impacts from specific exposures. Some of the most developed risk management practices relate to the handling of market volatilities, credit exposures, and actuarial risks that constitute central elements of the financial industry. 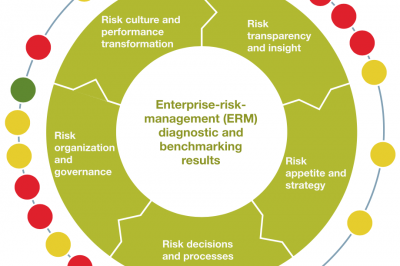 Many of these risk management techniques have gradually been transposed to other types of enterprise and extended to consider operational disruption and regulatory compliance issues within the context of enterprise-wide risk management frameworks. Dealing with these types of identifiable and measurable exposures is essential but organizations must also stand ready and prepare for the unexpected events since many strategic risks bound in economic, competitive, and political factors that are difficult to foresee and quantify but nonetheless constitute some of the most significant exposures (See Figure 1). Hence, there is a need to identify the organizational structures and strategic decision processes that can facilitate responsiveness to these types of risk. The formal risk management process starts with the identification of significant factors that expose economic activities not unlike analyses of strengths, weaknesses, opportunities, and threats (SWOT) in conventional strategy analysis. Once the risk factors are identified, the vulnerability to different types of risk is analyzed and potential economic effects determined. Stipulations of potential losses provide a basis for analyzing incremental benefits from risk mitigation efforts and assessing the need to cover excess exposures through alternative risk-transfer and financing arrangements. Formal risk management is an ongoing process comprised by sequential steps of risk identification, evaluation, hedging, and monitoring over time to keep abreast of new exposures. This normative description of risk management is generally recognized but we know less about how the handling of diverse exposures can be integrated within the strategic management process. However, the strategic planning process follows quite comparable steps of environmental analyses, formulation, and performance monitoring through strategic control (See Figure 2). In this context, it should be possible to integrate and coordinate the risk management and strategic planning processes. Nonetheless, while risk assessment and planning exercises deal with observable phenomena, many important strategic risks are harder to quantify as they bound in human behavior, competitor moves, technology shifts, product innovation, political events, etc. The effective handling of such ‘unknowable’ risks cannot rely solely on formal controls but also depends on interactive strategic decision making and an ability to stay proactive by engaging in responsive actions. So far, little effort has been devoted to outline the contours of these effective strategic risk management processes. Hence, a major purpose of a new research initiative (the Strategic Risk Management Project – SRMP, see insert below) has been to investigate proactive organizational risk management practices and identify the organizational characteristics associated with superior economic performance and risk management outcomes. Several inroads have been made to deal systematically with risks in more integrative ways. Over the past decade, the financial industry has developed quite sophisticated models to assess interacting influences of various market risks and stipulate associated exposures. The economic exposures of multinational enterprise have been analyzed based on the interaction of macroeconomic variables and simulation of future environmental and operational scenarios. These approaches are considered in enterprise-wide management models with the aim of incorporating a wider range of exposures in integrative risk analyses. However, the diversity of risk management practices spans from extremely data rich value-at-risk calculations of financial market exposures to more general assessments of opportunities and threats with relatively poor data support. They also reflect a high degree of specialization around the handling of specific risk exposures. Hence, a major challenge of strategic risk management relates to an ability of maintaining the necessary analytical expertise when handling specific exposures while integrating the various risk management aspects in overall strategic assessments. There is a need to better understand how organizations operating in turbulent environments can deal effectively with major exposures where many different risk factors have relevance in the overall strategic considerations. Public policies influence the risk impacts by supporting preventive efforts and avoiding moral hazards in direct interventions. Corporate governance matters as boards shape risk awareness in organizations and impose monitoring practices. The leadership of top management affects the engagement of middle managers and employees and sets operational policies and reward systems that motivate and drive behaviors. Central elements of strategic management comprise risk management considerations in conjunction with mission statements, environmental analyses, contingency planning, and strategic controls. Strategic responsiveness is also influenced by organizational decision structures and the ability to absorb market intelligence while processing, communicating, and interpreting this information for adaptive purposes. Developing better insights into these more complex strategic risk management processes will improve the ability to deal effectively with the diverse risk factors that prevail under turbulent market conditions. Initial findings from the research effort indicate that strategic risk management can limit the adverse effects of exogenous shocks and exploit opportunities arising in dynamic market environments. Hence, effective risk management allows corporations to increase economic returns and reduce performance risk at the same time. Organizational slack can induce corporate entrepreneurship and innovation, which in turn enhance proactive investment in opportunities supported by available financial resources. Hence, effective risk management practices and strategic response capabilities are essential for wealth creation under global market turbulence. Proactive behaviors should be encouraged to facilitate the creation and exploitation of new opportunities and avoid the downside losses associated with abrupt environmental changes whatever their causes. As this risk management scope is extended from conventional areas of insurable hazards, economic exposures, and operational risk to consider strategic exposures, such as, competitive developments, socio-political trends, and new technologies, other approaches to risk management increase in relevance (See Figure 3). The treatment of firm-specific exposures may adopt real-options reasoning as a vehicle to identify, develop, and execute alternative strategic actions that increase flexibility, maneuverability, and responsiveness. Access to diverse resources, e.g., through multinational networking, may create global opportunities that expand strategic alternatives. Organizational structure becomes important, as decision making, motivation, and informal communication channels influence the ability to take responsive actions. All the while, planning, control, and information systems can enable coordination and drive economic efficiencies. In short, effective risk management practices build on more complex strategy making processes that integrate important exposures, provide flexibility for responsive actions, and maintain supportive planning and control mechanisms. Strategic Risk Management Project (SRMP) – The global business environments are highly turbulent as innovations mold the competitive landscape, political events disrupt market conditions, and environmental hazards expose the economic infrastructure while financial markets are as erratic as ever. Under these circumstances firms must improve their strategic response capabilities to thrive. Important inroads have been made through the establishment of formal risk management practices initially geared to the financial industry but gradually extended into more general enterprise-wide approaches. But the risk management challenge goes beyond an ability to manage financial market risks and insurable hazards and corporate exposures often deal with more complex operational, competitive, and strategic risk factors that are hard to quantify. Hence, the major aim of this research effort is to provide new insights beyond the conventional scope of risk management and identify effective strategy processes that respond better to the new environmental reality. This research program anchored with the Center for Strategic Management & Globalization at the Copenhagen Business School was initiated in December 2005 with economic support from AON Insurance, Ernst & Young, Nordea Bank, TDC, and Novozymes. Andersen, T. J., Denrell, J., and Bettis, R. A. (2007). Strategic Responsiveness and the Bowman Paradox, Strategic Management Journal (forthcoming). Andersen, T. J. (2006). Global Derivatives: A Strategic Risk Management Perspective, 2006, Pearson Education, Harlow, England. Andersen, T. J. (ed.) (2006). Perspectives on Strategic Risk Management, CBS Press, Copenhagen, Denmark. Andersen, T. J. (2005). The Performance Effect of Computer-Mediated Communication and Decentralized Strategic Decision Making, Journal of Business Research. Andersen, T. J. and Foss, N. J. (2005). Strategic Opportunity and Economic Performance in Multinational Enterprises: The Role and Effects of Information and Communication Technology, International Journal of Management. Andersen, T. J. (2005). Applications of Risk Financing Techniques to Manage Economic Exposures to Natural Hazards, Inter-American Development Bank (IADB), Washington, D.C.
Andersen, T. J. (2004). International Risk Transfer and Financing Solutions for Catastrophe Exposures, Financial Market Trends, 87, OECD, Paris. Andersen, T. J. (2004). Integrating Decentralized Strategy Making and Strategic Planning Processes in Dynamic Environments, Journal of Management Studies. Andersen, T. J. (2004). Integrating the Strategy Formation Process: An International Perspective, European Management Journal. Andersen, T. J. (2003). Globalization and Natural Disasters: An Integrative Risk Management Approach, in Kreimer, A., Arnold, M. & Carlin, A. (eds. ), The Future of Disaster Risk, The World Bank, Washington, D.C. Professor of Strategic Management, Center for Strategic Management & Globalization, Copenhagen Business School, Porcelaenshaven 24, DK-2000 Frederiksberg, Denmark.